The summer of 2012 saw Team GB give its all in the London Olympics. It was exciting and surprisingly addictive. But despite my regularly tuning in to watch, I found myself feeling a little short changed. 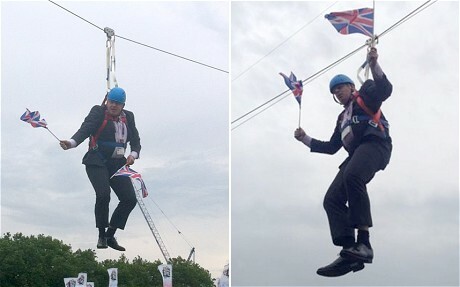 Sure, we got to see Boris Johnson get stuck on a zip wire, but where in these Olympic competitions were the truly traditional and defining events of Britain? Things like Shin Kicking (known as The British Martial Art), Nettle Eating, Cheese Rolling, Swan Upping and Wellie Wanging were all missing from the line up. The British are accomplished at the weird and wacky. With its long and varied past, any number of traditions and festivals, some more eccentric than others, have evolved over the centuries in the UK. Fortunately, I have the ultimate guidebook: Discovering English Customs and Traditions. This little known gem of a resource was a gift from friends when I first arrived in England. Not only does it list the traditions, but it also provides their origin. Arguably, it is difficult to be certain of how most of these customs and ceremonies got their start, but does it matter? The way I see it, the underlying point is to have a good time. Since moving to England, I’ve managed to witness, and even participate, in a few of these customs. I have no desire to have my shins kicked, nor have I pole danced, but I have watched Maypole Dancing. This pagan tradition, originally celebrating fertility and later romance and courtship, has performers dance circles around a tall pole that is decorated with garlands and ribbons. The steps of the dance lead to the ribbons becoming intertwined. Then more steps somehow result in the ribbons becoming untwined. A slightly more curious group of characters are the Morris Dancers. This may be one of the easiest traditional customs to observe because these folk dancers show up at just about any organized UK gathering. Some say Morris Dancing is pagan in origin; others (specifically, the Morris Dancing website) refute this claim. 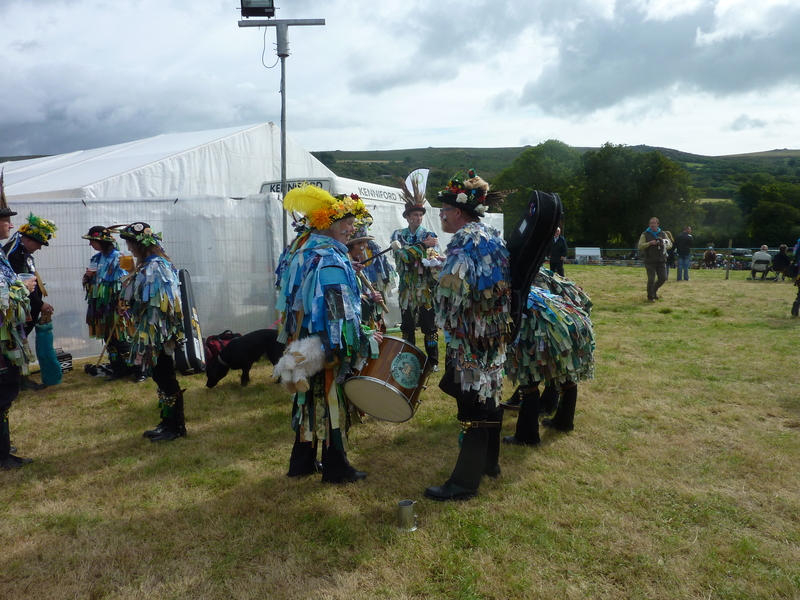 According to my little book, the fertility and pagan connections may be oversimplifications of the true Morris Dancing history, which were probably fifteenth-century European courtly dances. It appears wherever you happen upon a group of men and women dressed in folksy costumes with cloth strips hanging from their outfits, wearing hats and stepping about rhythmically, you’ve got yourself some Morris Dancers. Not all dancers are alike, though, as many carry an array of interesting props ranging from sticks and handkerchiefs to more sinister swords while performing. When we lived in East Sussex, the big Event was Lewes Bonfire Night, which is more akin to a semi-controlled wildfire. Bonfire Night, or Guy Fawkes Night, is the English national holiday to celebrate the day in 1605 when the British parliament wasn’t blown up and the subsequent death of a Catholic terrorist (Guy Fawkes) for planning the dastardly deed. In Lewes, the air is filled with choking smoke and deafening noise and the overall vibe is nothing short of rowdy. If in doubt, the message from the organizers says it all: “All persons should carefully note that attendance at Lewes Bonfire Night will constitue volenti non fit injuria, that is to say you will be deemed to have accepted any risk of injury or damage whatsoever, and no claim in respect thereof will lie against the organiser.” So, you’ve been warned is the long and short of that! 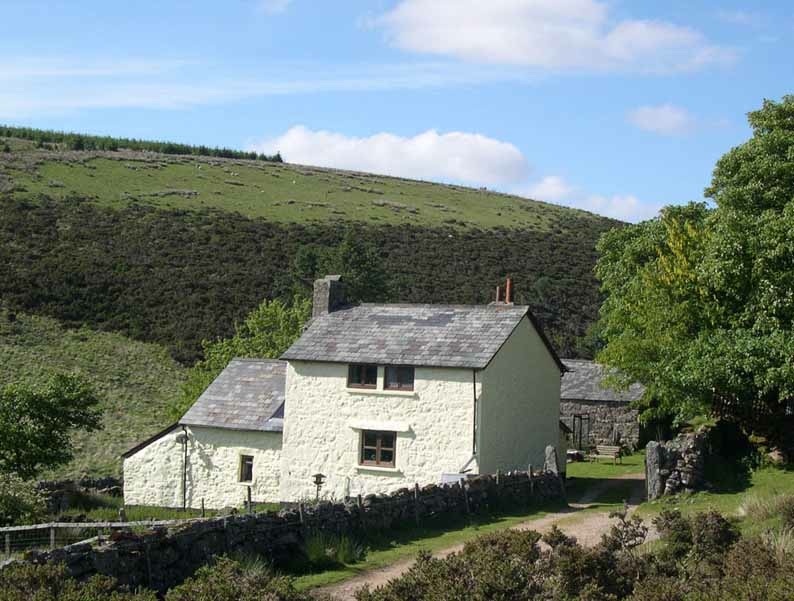 Like any other region in the UK, Dartmoor has its own traditions and customs: Mangle Mumping, Riding to Water, Wassailing or the more familiar, “Beating the Bounds”. Possibly medieval in origin, this ancient ritual involves parishioners walking the parish boundary, symbolically touching stones and markers with a rod to reaffirm the boundaries. In the City of London, Beating the Bounds happens each year on Ascension Day All Hallows. While this custom is not unique to Dartmoor, the boundary of Dartmoor Forest (our neck of the woods), which is about 50 miles in length, was first recorded as Beaten in 1240. Since then, this custom has mostly died out. Roger and I may start our own tradition of beating the bounds in places where we’ve repaired the walls, just to remind the sheep of the newly established no-go zone. Tom Pearce, Tom Pearce, lend me your grey mare. All along, down along, out along lea. Old Uncle Tom Cobley and all. This song, which immortalizes Widecombe Fair, turns out to be a popular folksong in England. Win recalled learning it as a young girl. The Devonshire Regiment is alleged to have sung this tune during the Boer Wars and more recently, it made its appearance as a theme song for the Exeter City football club. That is, until they experienced a losing streak, and dumped the song in hopes of changing their luck. Beyond the livestock competitions, none of us knew what to expect, so imagine our pleasure in witnessing a ferret race! We also tasted some good local foods, checked out some vintage farm machinery, schmoozed with a few people we’ve met since arriving in Dartmoor, and watched a horse-riding competition. We stopped by a dog agility competition and placed Sam at the front of the crowd of onlookers in the hopes that he would pick up a thing or two. Parading around the fair, astride his grey mare, was Uncle Tom Cobley himself, or at least a local resident dressed up as Uncle Tom Cobley. 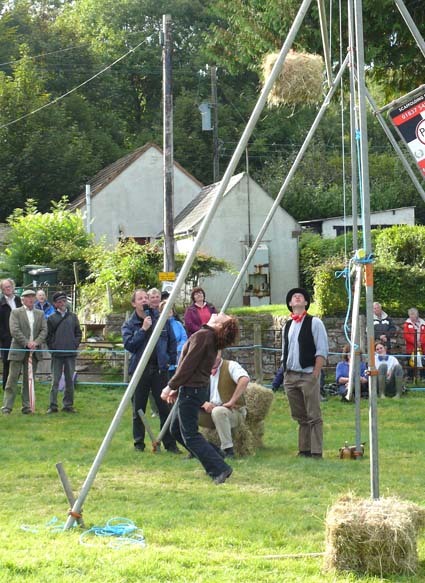 I had seen on a posted schedule that there was an open event called “Square Bail Tossing” and in my mind, no matter what else was on offer at the fair, this was an opportunity to see and participate in yet another wacky Brit tradition. Cheese Rolling at Cooper’s Hill in Glouchester. This event was cancelled in 2010 due to safety concerns over the number of people attending. And is it any surprise? Competitors hurl themselves down a steep hill attempting to catch an eight-pound round of Double Gloucester, which is set rolling down the hill just seconds before competitors begin their chase. To win, you must be the first to catch the cheese – without breaking your neck. Bog Snorkeling is an odd event where participants dive into a bog outfitted with goggles, flippers and a snorkel and then race across a trench filled with mud. Worm Charming is about attracting earthworms from the ground as a competitive sport. While it may not be an Olympic sport yet, since 1980 the Annual Worm Charming World Championship has been held in Cheshire. And like the worms themselves, give it time. Gurning has contestants put their heads through a horse collar before they are asked to turn their face into some sort of hideous Playdough creation. The ugliest and grossest wins. This is held each September at the Egremont Crab Fair. I’m there! 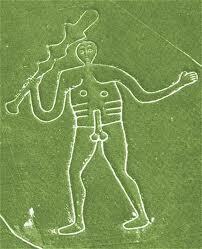 Dancing to the Cerne Abbas Giant. In Cerne Abbas, anyone wanting to let their hair down gathers in this small village, in neighbouring Dorset, to dance in tribute to one of the most suggestive of landmarks. This landmark has been described as: “A huge outline sculpted into the chalk hillside above the village of Cerne Abbas representing a naked, sexually aroused, club-wielding giant.” Now, that could be a fun day out. In the States, we have our own unusual traditions, such as Tailgating Parties, Presidential Turkey Pardons and of course, Punxsutawney Phil’s weather prediction on Groundhog’s Day. None are really rooted in ancient history, nor are they as enticing as Scottish Fire Ball Whirling, The Pearly Kings and Queens, Ladies Day at The Royal Ascot, Summer Solstice at Stonehenge, Tar Barrel Rolling or Swan Upping. Since moving to the UK I’ve seen a few of the classic celebrations, and in frustration, have even thrown my own Wellies when they sprang a leak (not the basis of the competition according to the World Wellie Wanging Association). 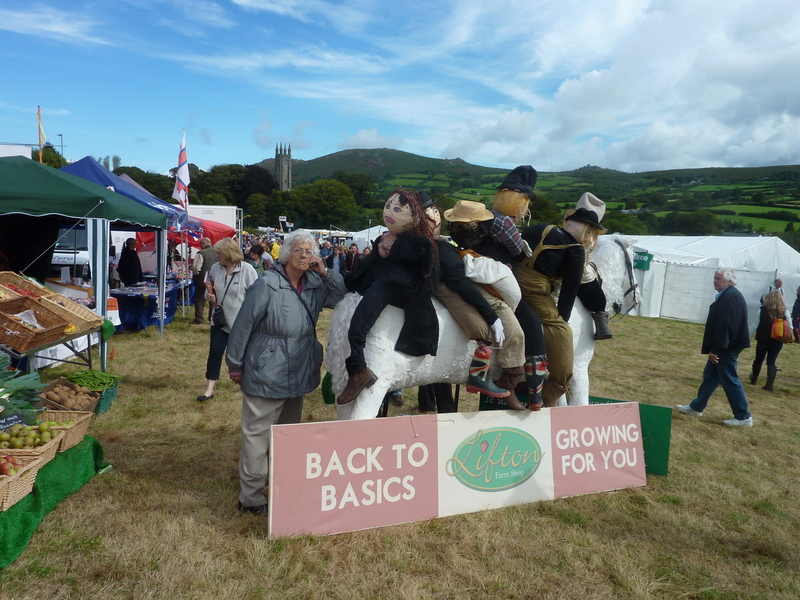 And now, I’ve been to Widecombe Fair. Sadly, we left before the Square Bale Tossing competition. But, there is always next year. Hopefully that will be me next year! Many of our indoor projects are on hold until the roofers appear to do repairs. It’s been a wet summer here, so their schedule has been delayed. 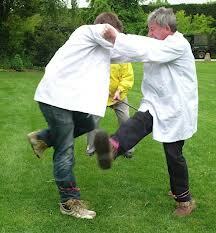 The weather, however, hasn’t dampened our ardour; indeed we’ve been busy outside. The potholes on the track are filled; we’ve taken down broken bits of the shed, replaced two gates, and done our best to secure the chicken coop against unwelcome guests. We’ve also constructed two compost bins; one is full of decomposing matter and will be ready to place on the garden in the early spring. The other is half full and just beginning to breakdown. For now, it is the current dumping ground for all of the cuttings, clippings, biodegradable kitchen waste, and remments of the weekly chicken coop cleaning. 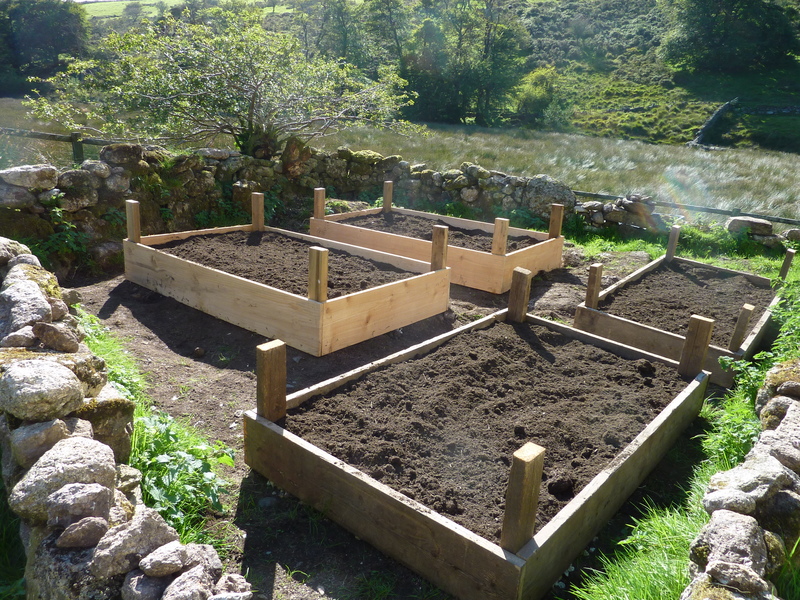 We’ve also finished building and preparing our raised vegetable beds and are ready to plant out our autumn garden. In planning our vegetable patch, we’ve read all the advice for success, which is clear: consider the location of the beds, the quality of the soil and monitor for pests. Full sun and protection from wind are critical. We have the full sun (when it isn’t cloudy or raining), but not much protection from the wind. Dartmoor soil tends to be slightly acidic, so we ordered a pH test kit. 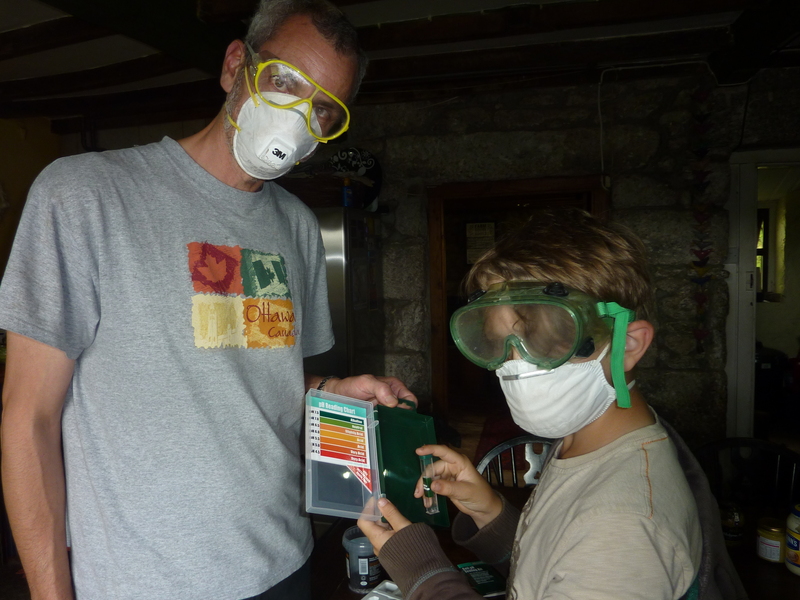 Roger and Thomas, our young assistant who was visiting with his Mom, went about the task of testing our soil. The results are that it is about 6. Not ideal, but we aren’t in bad shape as most vegetables like a pH of 6.5. Our last step toward garden success is to put our attentions to controlling one of the sneakiest and most determined of all threats: Slugs. The slugs we have been seeing this summer are not featherweight chumps. They are about 5 inches long and the size of mice. Our plants are at risk from these beastly gastropod molluscs, and we haven’t even started. Sunday found us outside working in the garden planting rhubarb, raspberries and a blueberry bush, when a group of men happened past carrying a keg of beer. Odd we thought as we live a half-mile up a track with nothing but wilderness beyond. Odder still, they were soon followed by another group of men, then a group of women, then one man with a keg on his back, and yet another group, all carrying kegs of beer. We asked one group what was going on and they told us it was a challenge walk. Interesting challenge! Gonna get drunk tonight like I’ve never been drunk before. My Dad taught me, along with a few of my friends, this drinking song. It is an unusual composition to teach ten year olds, but it is a catchy tune with fun lyrics. But I digress. 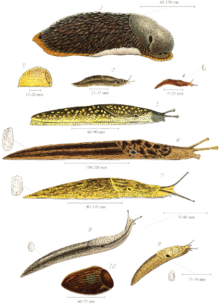 Slugs are slimy, supposedly inedible, and destroy gardens. Evidently, they are good at consuming dead vegetable matter, but they don’t stop there. They enthusiastically eat through anything that is leafy, flowering, or beginning to grow in a vegetable garden. And, I’m not alone in the hatred of the slug. Read any gardening website and it’s filled with comments from people at their wits end as they battle against the slug. They are also filled with endless tips of how to stop them in their slimy tracks. I won’t deny that I do like the slug pellet. There is nothing politically correct or organic about them, but they work. Sadly, they are poisonous and can cause problems for pets, wildlife, birds and beetles. Our chickens like to scratch in the garden bed, and we’re concerned that they might enjoy a pellet or two as their last supper. We’ve tried copper rings, ground up eggshells and gone out on the nighttime slug hunts. This is when, at dusk, the keen gardener is expected to lift leaves, pick up the slugs, and put them into a sealed container to feed to the birds and chickens the next morning. The one and only time I tried this, I picked off over 25 slugs and still haven’t recovered from the experience. One thing I won’t try is to eat them. I am a fan of Hugh Fearnley-Whittingstall, but draw the line at trying any of his slug recipes offered in one episode of River Cottage. You can stuff them with herbs and spices, batter them and even add chili and garlic, Hugh, but a slug is still what you’ve got. I wonder, is Hugh onto something, perhaps? There is a story on Dartmoor about the ruins of a farmhouse from the 1700s known locally as Snaily House. The story has it that the last inhabitants regularly enjoyed a tasty snack of bottled, salted slugs along with a few garden vegetables as their main sustenance. The local farmers believed the plump inhabitants of this farm could only be surviving by stealing their sheep. Imagine the community surprise upon discovering the true culinary delights within that home. No, I still say we aren’t meant to eat slugs. Case and point: recently a young man in Sydney dared to do so and spent time in an Intensive Care Unit. Maybe it was because the slug was raw or because it was just a slug. But is it a coincidence that Slugulus Eructo is the charm in Harry Potter that causes someone to belch out slugs and their associated slime for about ten minutes? I think not. Cuz when I’m drunk, I’m as happy as can be. Cuz I am a member of the Soused family. Now the Soused family is the best family, that every came over from Old Germany. With that childhood drinking song in my head and visions of hikers carrying kegs of beer, I reveal here our primary slug control approach: the slug pub. It’s simple: slugs love beer. Like Homer Simpson, they are attracted by the smell of most yeasty liquids. By placing a partly beer-filled jam jar into the ground, it is like turning on the neon open sign at the local pub. Slugs can’t help themselves. With luck they go for a pre-dinner drink and drown before setting out to munch on the garden. The marinated slugs can make a nice breakfast for chickens and birds the next morning. Let them eat the rascals. Cuz one of us could drink it all alone! As we move ahead, we’re hoping to win the battle against the slugs. We will continue to encourage birds, frogs and toads and hope that they will feast on any and all slugs they find. And, we’re hoping that the Bo-Jo’s of our garden come out to party, singing all the way!